These concentration games will help you practice the meanings of some very common phrasal verb idioms, as well as words from important Latin roots and irregular past tense verbs. They're also called memory games. You need to remember the locations of cards you have already turned over so you can find them again when you turn over the matching card. Concentration (also called Memory) is a card game in which a player or players try to match pairs of cards. All the cards (in this case 12) are laid out, face down, in rows.Players take turns turning over two cards, trying to get a match. If the cards do not match, they are turned back over and the next player takes a turn. All players concentrate on remembering the position of each card, so that when they see its match, they can turn both over on their next turn, winning that pair of cards. The game is over when all cards have been matched. The player with the most matches wins. You can also play these games alone, trying to match the cards faster than in your previous games. If you’re still not really sure of all the matches, play again and again, until you are completely comfortable with their meanings. Which Game Will You Try First? Idioms are groups of words that do not mean the same thing as the individual words put together. Some of our most common idioms are phrasal verbs-- a verb followed by one or more prepositions (technically particles), used to express a single thought. For example, you can turn a radio or a stove burner or the air conditioning on, off, up, or down. To turn it on is to start the electricity or gas running. To turn it off is to stop the flow of electricity. To turn up the volume (or the heat, or the A.C.) is to increase it, and to turn it down is to reduce it. English is rich in synonyms-- words that have very similar meanings. In conversation we almost always choose the shorter (Anglo-Saxon-based) words rather than the longer French/Latin ones. If you’d like to review these phrasal verbs before playing, see List of English Phrasal Verbs, A-M or List of Phrasal Verbs, P-W.
For Concentration Game 1 using phrasal verbs early in the alphabet, click here. EnglishHints has three more memory games for practicing the meanings of words made from various Latin root and prefix combinations. See Memory Game 1 (Acquire a Quest?) for practicing roots from the Latin verb quaerere: require, inquisitive, quest, etc. Memory Game 2 practices words from cedere: precede, success, etc., and Memory Game 3 practices vertere: convert, reverse, etc. There are also three games for matching the irregular pasts with the main present tense (and infinitive) form of 17 important irregular verbs in English. The verb 'to be' has two matches: am/is with was and are with were). Other verbs practiced are do, get, go, have (all in irregular verb game 1), eat, make, say, see, take, tell (game 2), and buy, find, give, know, leave, and think (game 3.). 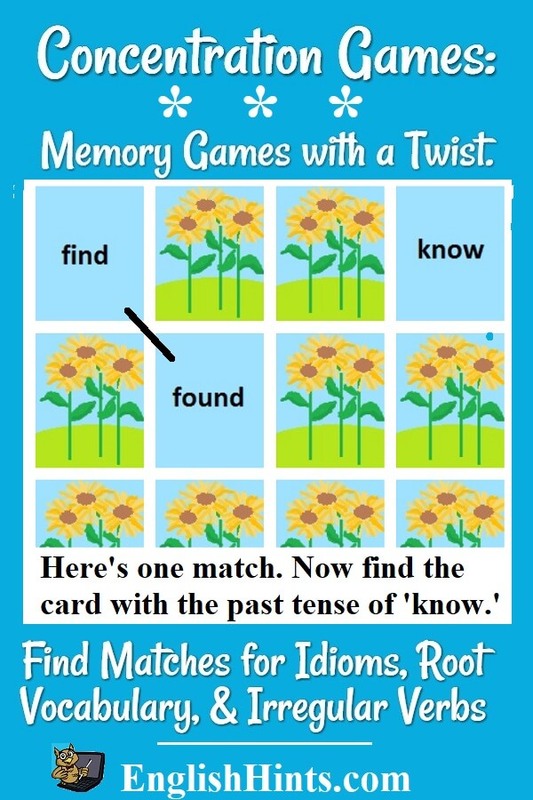 For more memory work-outs, see Games of Memory for Kids These games are designed for children, but they're good for stretching adult memories too. Enjoy the mental work-out you get from these memory and concentration games! Home> ESL Games> Concentration Games.